The rapid development of emerging imaging sensors technologies (3D/4D cameras, medical imaging devices, cost-effective depth cameras, 3D/4D microscopy, etc.) brings at forefront large imaging data in 2D, 3D and 4D and is pushing forth a new research direction to study patterns and shapes from image data as well as their motion for advanced modeling, statistical analysis and behavioral understanding. The goal of the workshop is to promote interaction and collaboration among researchers working on computer vision, machine learning and computational geometry for the static and dynamic pattern recognition and shape analysis as well as various applications, e.g., video scene understanding, affective computing, human-machine interaction, computer animation, robotics, cultural heritage conservation, healthcare assessment and medical diagnostics. The perspective of RFMI will be to strengthen the relationship between the many areas that have as a key meeting point, the study of patterns and shapes and their motion from image data and the design of relevant geometric and computational tools. Thus, it will be a great opportunity to encourage links between researchers who share common problems and frequently use similar tools. 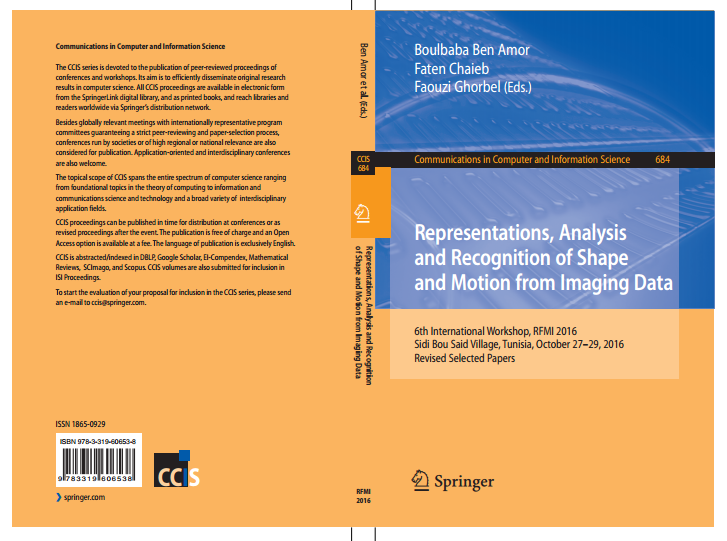 The seventh edition of the international workshop on Representations, analysis and recognition of shape and motion FroM Image data (RFMI'2017) will take place at the Centre Paul-Langevin Aussois - Savoie, France. It consists of three days oral sessions, poster sessions and outstanding plenary invited talks. The workshop topics will feature not only sessions on fundamental issues in computer vision, machine learning and computational geometry but also specific tracks on various applications, e.g., Biometrics, Surveillance and Analysis of humans, Biomedical Image Analysis and Applications, and Art, Cultural Heritage and Entertainment. It is planned to publish the RFMI'2017 proceedings by Springer in the Communications in Computer and Information Science series (http://www.springer.com/us/book/9783319606538). The endorsement of the workshop by the IAPR association is under process (read about the previous edition in the IAPR newsletter http://www.iapr.org/docs/newsletter-2017-02.pdf). - "RFMI'2017 endorsed by the IAPR"